There are good fishing and hunting in the southern part of the Finnforest. There are plenty of perch and pike. The local hunting and fishing association reports 17 nice lakes, ponds, and rivers to enjoy fishing. Perch exists in large. So does pike. There are also trout; especially in the forest of Varandskogen. These are small pounds. Usually one needs to walk a bit to reach the ponds where it is possible to fish trout. We use spinning bait to catch the pike and earthworm on the perch. To fish pike we either use worms or hackle. It is possible to conduct fishing from land or from boat or canoe. 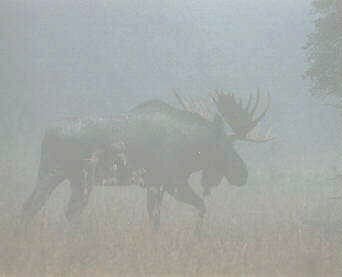 There are moose hunting, deer hunting, and hunting on especially hare, black grouse and capercailzie (woodgrouse). Moose and deer hunting are reserved for landowners in Norway, but hunting on birds and hare are free for all people as long as you buy a licence. We provide licence for a larger hunting area; approx. 30.000 da. There are certain rules for doing hunting. You will find prices for the hunt as it was presented last year. We can provide housing close to the hunting terrain and the fishing waters. We may also serve you the meals. We have water closets, showers, and souna. We can provide transportation according to your need. Welcome to us at Solhaug!! We have boat you may borrow for fishing. It is nice fishing in the lakes of Utgårdsjøen, Møkeren og Varaldsjøen. In the Utgårdsjøen, the fishing is free. In the two other lakes you must buy a fishing certificat. Inn these lakes you will find trout, pike, perce, and roach. The three first are very popular here. The accessability to the waters are very good summer and winter. We can provide additional information about other waters, lakes, and rivers close by. Please contact us if you are interested. We can also provide you with maps. The time for hunting are, according to the government, from September to new years evening for smaller animals (hare and birds). There is a break when moose hunting takes place two weeks of October. There are nice possibility for hunting smaller animals in our area. Hunting on home fields are prohibited. There has been a lot of birds the last years. For Scandinavians: You can registrer weapon you need to bring into Sweden on the Internet. Push here (The Swedish Customs) if this is necessary; i.e. if you want to hunt in Sweden as well as in Norway. The price for hunting lincence (birds/hare) was for the season 2002: pr. day (in a weekend): NOK. 150. Per day (during weekdays): NOK 100. Map: NOK 25. Larger map of the area: NOK 70. You must pay the governmental hunting licence in order to buy the local licence (to the forestry owners). Contact us if you want to buy licences. We mediate/arrange contact. Map and assignment of the hunting area you receive at our place. · Treat the wepon as if it is always loaded.